How Do You Multiply Pure Imaginary Numbers? You can multiply imaginary numbers like you multiply variables. Just remember that 'i' isn't a variable, it's an imaginary unit! 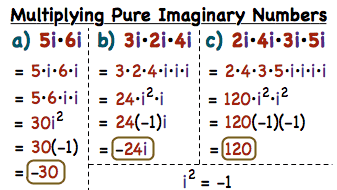 This tutorial shows you the steps to find the product of pure imaginary numbers. What is the Imaginary Unit i? Every tried to take the square root of a negative number? You'll need the imaginary unit 'i' to write the answer. This tutorial introduces you to this useful imaginary unit. Imaginary numbers are used to help us work with numbers that involve taking the square root of a negative number. In this tutorial, you'll be introduced to imaginary numbers and learn that they're a type of complex number.